This is a ranking of the top schools for an online computer science degree in 2016. The interest in obtaining a computer science degree online has risen in step with the demand for professionals in computer science and related fields. Computer science is a field that’s expected to increase 19% through 2020 as the demand for professionals with a bachelor’s degree continues. The average salary for graduates with a degree and experience in some of the top areas of computer science is almost $90,000 according to Indeed.com. Graduates are being hired by companies like Dell, Amazon, Microsoft and Oracle. Employers are pushing their current staff to obtain a degree and more and more are only hiring new recruits who have already obtained a degree. This push for existing computer science professionals to earn their degree and the promise of job security and above average wages is causing an increase in demand for quality online programs. These online programs can often be completed around work and family obligations which allow the adult learner or those ready for a career change to earn their degree. Finding a reputable program which meets a students’ unique needs is essential. We created this ranking of the top schools offering an online degree in the field of computer science. Data for this ranking was gathered from College Navigator based on school graduation rate, cost, student to faculty ratio and percentage of applicants admitted. We looked for schools offering online bachelor’s in computer science, including online IT degrees, online software engineering degrees, online database development degrees, online web and application programming degrees, and online project management degrees. From this group, we applied ranking criteria and came up with our list of the top 30 schools offering these programs. Where there are ties, the school with the lowest net cost was awarded a higher ranking. Western Governors University offers a unique competency-based approach to their online accredited computer science degree programs. Students are able to pass through courses quickly with demonstrated proficiency allowing many students who have already obtained their A.S. degree to graduate in one year or less. The program is available to experienced IT professionals. Students are assigned a Faculty Mentor which helps them establish pace and a personalized degree plan. Western Governors is a Microsoft IT Academy program member and offers world class technical curriculum and coursework in many of its programs. South Texas College offers an extensive list of supports for students pursuing an online Bachelor’s degree in Computer and Information Technologies. Students have access to online advising, career counseling services, online orientation, and online tutoring to help ensure success. In addition to technology skills, students are taught professional skills including ethics, group work, and technical communications. Coursework is relevant to current trends in technology and updated on a regular basis. Computer Science and Information Technology students at DePaul University can complete their degree entirely online. Programs are not self paced; they follow a schedule which keeps students on track for completion. Students can also receive assistance from the Academic Success Center which provides advisement services to assist students with planning their degree path. While the program is online, students are required to take in-person proctored exams. Online students are able to view course lectures in a virtual environment. These Bachelor’s degree programs prepare students for either graduate school or in the workforce. The accredited online Bachelor’s of Information Sciences and Technology degree program from Penn State World Campus is available to both the beginning and advanced IT professional. Throughout the program, students are able to work on credentials to build their professional portfolio. The Integration and Application program option (ITINT) is for students interested in business and working with high-level strategic organizations. Students have the opportunity to work on team programming exercises. Students who take the Information Systems-Design and Development option (ISDEV) work to develop advanced information technology systems. This option is project oriented. Courses for both options are offered in an asynchronous format with plenty of flexibility. Georgia Southern University offers the WebBSIT degree program which allows students interested in a career in computer IT to complete their degree online. The program is a degree completion program for students who have already completed their general electives. Students can benefit from an extensive network of peers and participate in classes through a state of the art virtual learning platform. The program is ideal for those who might not otherwise be able to complete a degree such as working parents and active military. The WebBSIT program accepts new students throughout the school year. The University of Wisconsin at Milwaukee offers a unique competency-based online degree in Information Science and Technology using a Flex Option. As the only IT degree offered in this format in the state, the degree is competency based versus “seat time” based. Student progress is determined by assessment of key competencies as they move through this program on their own schedule. Areas of study include information science, information architecture and information technology. Students work with an Academic Success Coach rather than a professor to answer questions, determine progress and work on a personally created degree plan. Arizona State University offers several different computer science-related degree options for those looking to begin or advance their career in the technical field. Students interested in Information Technology can select from three different program tracks including security and administration, video game design and construction, and web applications. The Software Engineering program prepares students for a career as an application software engineer and offers a project driven curriculum. Faculty are interactive and engaging with years of experience in the computer science field. The University of Maine at Augusta offers two online programs in computer science including an online Bachelor’s degree in Computer Information Systems and an online program in Cybersecurity. Students in both programs are able to benefit from the latest in virtual education including video streaming, Class Capture, ITV and online instruction methods. The program is available to both full- and part-time students who may be experienced or brand new to the field. Graduates are prepared to work in a variety of areas including software development and network and security administration. Cal State Online offers a Bachelor’s degree in Computer Science available to students fully online in a cohort format. Courses include computer mathematics, programming and problem solving and are designed with input from an industry advisory board. Students benefit from interactive projects and hands on technical experience. Prior to graduation, students have the opportunity to complete a professional portfolio and a capstone project which illustrates their skills aquired while in the program. An online Bachelor’s degree in Technology Development and Management from St. Petersburg College prepares students for careers in computer and information systems, programming, systems analysis, and development. Courses are offered entirely online in eight week sessions. Active Advisory Committee members make sure the program matches the latest industry needs. Students can select from four different specializations including data analysis, information security assurances, project management and software development. Indian River State College is an accredited institution offering stuents an online degree in Information Technology Management/Cyber Security. To participate in the program, students need to already hold an AA or AS degree (which can also completed at IRSC). Students enrolled in the program complete courses in areas including database design and administration, network security, computer forensics, and business management. IRSC is recognized as an “Acheiving the Dream” college for supporting students during the application process through graduation and job placement. IRSC was named the 4th Most Affordable College in the United Stated by United States Department of Education. Northwood University is an accredited institution offering an online degree in Computer Information Management. The program is offered as a degree completion program for working or busy adults. Students learn from case studies and benefit from a project based learning approach. Students are prepared for careers in computer information systems, technical project management, database administration and consulting. Northwood has an extensive alumni network of over 30,000 students. George Mason University offers an online degree completion program in Information Technology that can be completely entirely online. The program is accredited by the Computing Accreditation Commission of ABET. The curriculum has been industry validated and prepares students for graduate school as well as the workforce. Students can attend full or part time. Students benefit from student support services which includes phone consultations. George Mason University strives to understand and teach ethical and social responsibility for IT professionals. The University of Massachusetts offers an online Information Technology Bachelor’s degree program delivered by experienced and dedicated faculty. Course content is updated on a regular basis to keep information fresh and relevant. The program can be completed in 120 credit hours and is flexible enough for the working adult to be successful. The University of Massachusetts IT program was ranked by Get Educated as a Top Affordable Online IT Degree. Old Dominion University offers an online bachelor’s degree program in Computer Science. The program engages students through hands on lab experiences. Some classes are offered through live online meetings where students attend virtually along with their traditional counterparts. Some coursework is offered in an accelerated format to allow students to focus and complete quickly. Coursework is accessible through computers or mobile devices. Academic advisors help students plan their degree program. Old Dominion has over 30 years’ experience in distance education. Central Washington University offers two distinct online Information Technology and Administrative Management Bachelor’s degree programs. The Bachelor of Science degree, Retail Management and Technology specialization can be completed through the FlexIT option or as a more traditional online program. Students must have an AA-DTA or bachelor’s degree to apply. Students in the FlexIT option pay a set fee for six months of “all you can learn” courses. This option is fully online and self paced, offered in a compentency-based, accelerated format. The BAS degree program offers three specializations and is open to any student with a two-year degree. Specialization options include Administration Management, Cybersecurity, and IT. Medaille College offers an online degree completion program in Business Administration in Information Systems that can be completed in two years. Professors are experienced in the field which helps students develop professional networks to find employment. Courses are offered in seven week sessions with no scheduled class times. Students benefit from flexible, experiential learning opportunities with personalized attention. Graduates are prepared to enter the workforce in a variety of positions such as database administrators, application developers and systems analysts. Northwestern State University of Louisiana offers an online Bachelor’s degree program in Computer Information Systems that provides students with hands-on experience in database, networking, cloud computing, programming and several other areas of CIS. The program allows students to obtain certifications in Cisco, A+, Security+ and many others. The program offers three concentration areas including Application Development, Networking and Systems Management, and Web Development. Some courses require proctored exams that may completed at a university near the student’s home. Oklahoma State University Institute of Technology offers an online Bachelor’s of Technology degree in Information Technology. During the course of the program, students take coursework which helps them understand computer hardware, networking, programming and web development. Students may earn certifications during the program. Concentrations are available in Information Awareness and Forensics, Network Infrastructure, Software Development, and IT Enterprise Management. Students can transfer up to 61 credit hours from a two year institution and must have an Associate in Applied Science (or higher) to begin the program. Daytona State College offers an online Bachelor’s degree program in Information Technology though the School of Engineering Technology. The program teaches students about development, delivery, management and security of IT systems in large and small scale environments. Coursework includes math and science with an emphasis on application. Graduates are prepared to enter the workforce in areas of information technology, network security, digital forensics and programming. Students must have earned an Associates degree prior to admission to the program. An online Bachelor’s degree in Business Administration with a concentration in Computer Information Systems is a good choice for those looking for a comprehensive online curriculum. Students are taught principles related to ethics, analytic ability, creativity, and communications. The program is designed for the working adult and over 60% of courses are based on case methodology. Graduates are prepared for positions as systems analysts, software programmers and database administrators. Prior to graduation, students complete a capstone experience and presentation. Milligan College offers an online Bachelor’s degree in Computer Information Systems for the non-traditional or working student. There is no previous college experience required for the program. The program uses the latest virtual technology to deliver content through MP3s, podcasts and simulators for lab activities. Faculty have demonstrated commitment to student success and are both qualified and experienced in the field of IT. The program is designed to mirror the traditional brick and mortar program by providing the same high quality, personalized approach. Milligan is ranked as a top Regional College of the South by U.S. News and World Report and by the Washington Monthly as a Top 25 Baccalaureate College. King University offers an online Bachelor’s degree completion program in Information Technology. Students are able to choose from among three concentrations including Cyber Security, Network Management, or Programming. The program can be completed in 124 semester hours, but major coursework can be completed in less than 16 months. Students graduate prepared to manage individuals or organizations, evaluate the use of new technology across an enterprise and evaluate the technology climate of a particular institution. Students must pass a comprehensive general education assessment exam prior to graduation. The University of West Florida offers an online BS in Information Technology with a specialization in Networking and Communications. The program provides students with a solid foundation needed to be successful in the field including coursework in applications of information technology, database systems, business foundations and web environments. The program allows students to take courses in focus areas including Computer Web Development Technologies, or Business and Communications. Students are able to complete either an internship or a practicum prior to graduation to gain practical experience. Park University offers two online computer science-related degree programs for those looking to enter or advance in the field of computer science. Courses start five times each year and last eight weeks. Faculty are experience in various areas of computer science. Students are educated in computer usage as well as business management which allows them to be successful in a collaborative environment. Students are taught the skills to understand and explain complicated IT concepts in a business environment. The Computer Information Systems online Bachelor’s degree program at Jones College prepares students for careers as computer programmers, systems analysts and other kinds of IT professionals. Coursework is relevant and taught by experienced professionals. The program includes courses such as Business Systems and Web Performance. Students are provided with an online orientation before their first course to get them prepared. Students can expect a challenging learning environment where they learn practical skills and knowledge for success in the computer science field. The University of Illinois-Springfield offers a fully online, accredited Bachelor’s degree program in computer science. Graduates of the program are prepared to enter the workforce or continue on to graduate school. Students can opt for emphases in software engineering or systems security and information assurance. New students are admitted in the spring and fall. 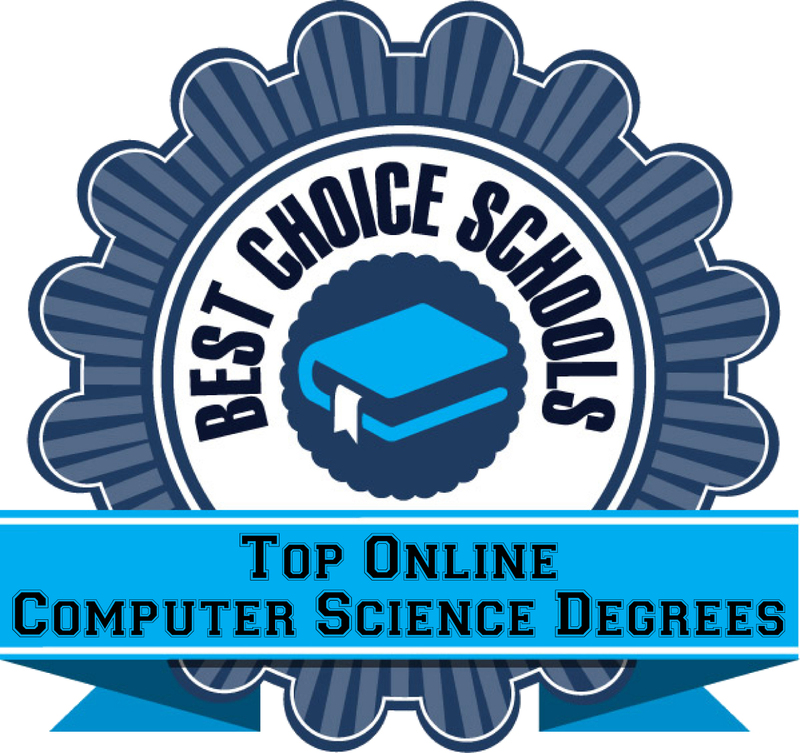 BestColleges.com ranked the University of Illinois-Springfield in their list of “Best Online Programs” and Best Computer Science Degrees ranked the program 2nd in their list of the best online computer science programs. The Department of Computer Science is designated as a National Center of Academic Excellence in Cyber Defense Education. The Bachelor of Science in Information Technology Management prepares students for a career working in business, industry, or education. The program has the same content as the traditional face-to-face program but allows students the flexibility to log in when its convenient. Students have access to individual advising and student support services. Instructors are experienced educators in the field and keep engaged with their online students. Coursework can be completed entirely online without any on-campus visits. Peirce College offers an accredited online degree in either Information Technology or Technology Management. Students have the opportunity to earn IT Certifications along the way through a partnership with CompTIA to provide affordable certification testing. The Information Technology program offers concentrations in either Networking, Administration & Information Security, or Programming and Application Development. The Technology Management program is designed for working adults who have already earned college level credits. BestColleges.com included Peirce in the 2015 ranking of Best Online Programs in Information Technology. 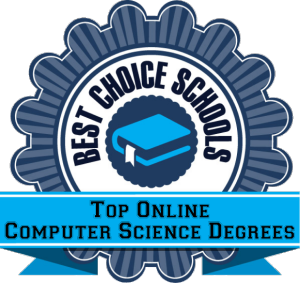 This concludes our ranking of the best schools for an online computer science degree. What is the Employment Outlook for Computer Science Careers? How Much do Computer Science Professionals Earn?